Ramona and Beezus – The Movie! As much as I love to read now, I was a reluctant reader as a child. I did not like teachers telling me that I had to read so many books each month, or a specific title. Thankfully, there were books out there that made me want to read and keep at it. Beverly Cleary is an author that saved me for years. Thanks to her books, I was able to find characters that would keep me engaged in reading and laughing while I went. If you are not familiar with the name Beverly Cleary, you may remember her infamous Ramona Quimby. Ramona was the Junie B. Jones of my generation – only she keeps on giving. Ramona and her family and friends continue to keep generations of kids reading to see what quirky adventure she will go on. I have secretly been wishing and waiting for NHL (almost 7) to be ready to read the Ramona books to share the experience with him. Several months ago, I heard that they were finishing up a movie called Ramona and Beezus. I had mixed emotions. Movies that are based on books often do not live up to my expectations (see Cloudy With A Chance of Meatballs – my favorite picture book). Of course, the Harry Potter movies have created a new level of book to movie phenomena. While teaching, I also did comparisons of books and Hollywood versions with my students (perfect Vehn Diagram opportunity for pre-writing). I knew that I had to see this movie. Time went by and I heard bits and pieces about the movie. Then out of the blue, we were invited to a pre-screening of Ramona and Beezus (rated G) last week (it opens TODAY). The boys and I went, along with my Aunt S and grandmother to see Ramona and Beezus on the big screen. Thanks to the quick nature of this, I did not have time to reread the books, so my memories of Ramona are sketchy at best. When the movie began, I was instantly brought back to my childhood. Here was Ramona, Beezus, Picky Picky, Henry Higgins and the rest of the gang in front of my eyes. Thanks to Selena Gomez (Beezus in the movie), I have the official Ramona and Beezus Trailer to show you. Sit back, relax and enjoy! Let me begin by saying that I really enjoyed the movie. Every time a new actor came onto the screen as a familiar character, I was taken a bit more into the wonderful and wacky world of Ramona Quimby. While watching the movie, I made a mental note that I had to find my old copies of the books to reread. The story of Ramona and Beezus is classic. There are two sisters realizing the important family bond as they move through some struggles in life to save their home. The movie really lives up to the tagline: "A Little Sister Goes A Long Way." Joey King was Ramona and did a fabulous job in the role. She was cute, spunky and had the Ramona timing down. It really is hard to believe that this is her first motion picture appearance. 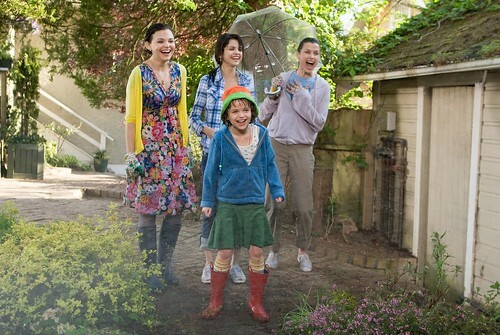 The chemistry between Ramona and Beezus was also special in this film. Selena Gomez takes on the role of big sister Beezus and plays the perfect teenage counterpart to King’s Ramona. The two young ladies without a doubt brought the world of Ramona from the pages to the big screen. Simply stated, director Elizabeth Allen created Ramona’s world in this film. She did a great job going from the serious scenes about the family losing their house, to Ramona’s day dreams and back to the silly water fight and lemonade scenes. In addition to Joey King and Selena Gomez, the cast of actors in Ramona and Beezus helped this classic book come alive for fans of all ages. I am a long time fan of John Corbett and enjoyed seeing him as Robert Quimby. He showed his softer side and really had nice chemistry with Joey King, especially during the drawing scene with her. Bridget Moynahan was Dorothy Quimby. She played a serious mom, who could see the humor in a the antics of her quirky little girl. One of the best surprises in the movie was Ginnifer Goodwin in the role of Ramona’s beloved Aunt Bea. As a big fan of Big Love, it was nice seeing her spread her wings and show more of the comedic timing that is sometimes hinted at when playing Margene. Josh Duhamel as Hobart is a great counterpart to Goodwin and works well with the kids in the film. One other big surprise to me was Sandra Oh (Dr. Cristina Yang on Grey’s Anatomy) as Mrs. Meacham. As a teacher, I loved her portrayal of the straight-laced and slightly sarcastic Mrs. Meacham. Of course, I have to admit, I did see hints of Dr. Yang coming into the role – especially when she rolled her eyes a certain way. Overall, I really enjoyed the movie. I do believe that Ramona fans of all ages will appreciate the book coming alive in front of their eyes. On the flip side, my almost seven year old son now wants to read the Ramona books. He had never heard of Ramona before the movie and is now excited to read more about this quirky little girl. Today, I will be heading out to get a copy of the book to use as the perfect summer read aloud now that we have seen the movie. Oh, I am purposely not telling you my favorite scenes from the movie since I do not want to spoil anything for you when you go and see it. I highly recommend the movie Ramona and Beezus to people that grew up with Ramona and new fans alike (also a great summer family movie). The storyline and acting will help keep you in the land of Ramona Quimby and begging Beverly Cleary for more wonderful literary creations. Disclosure: I received complementary passes for my family to see the pre-screening of Ramona and Beezus from the PR agency releasing the movie. No other compensation was given. All opinions expressed in this review are 100% mine. All pictures used with permission. Photos by Alan Markfield. 2010 Twentieth Century Fox and Walden Media, LLC. Was given special permission to use these photos after viewing the pre-screening of the movie as a member of the media. How timely! I’m heading to a special screening of the movie tomorrow!